Kirk and Spock beam down to the surface of planet Organia to negotiate for the erection of a Federation base on that planet. Hostilities between the nearby Klingon Empire and Federation have reached alarming heights and it is feared that the medieval culture of the Organians will not be able to withstand a Klingon attack. However, the Organian Council, comprised of five seemingly pleasant, benign elderly men, insist that they prefer to stay with their more primitive culture. 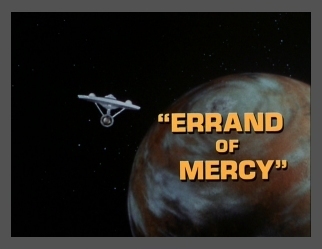 When Kor and his Klingon force attack the planet, Kirk and Spock go undercover as Organian and Vulcan traders. They are captured by the Klingons, and to their surprise, the Organians free them with ease. In turn, the Klingon ship and the U.S.S. Enterprise square off to battle in orbit of the planet. Displeased by the outbreak of violence, the Organians reveal themselves to be powerful creatures of pure energy who easily neutralize the weapons on both ships, thus ending the threat for the moment. Back on the U.S.S. Enterprise, Kirk feels certain that the Organians will not only take care of themselves in the future, but monitor their surroundings for any hint of hostilities. unit numbers like this. It just sounds silly. Kirk thought of himself as an explorer. because it sounded better in this instance. What about the Prime Directive? history and he did a fantastic job! of a heart attack on March 6, 2000. There were lots of Canadians involved in Star Trek! Both Kor and Kirk have great lines here. Even though it sounds like Kor calls Kirk "Barona"
the Star Trek Concordance lists it as "Baroner." that Kor seems to be the one in command. Wow, 1000 Organians for every Klingon. These Klingons are mean dudes! Kor sounds like he enjoys watching the procedure! Even in a dangerous situation they joke around! of DS9 but it just wasn't the same. That's quite the admission by Kor. are a bunch of whimps. There he goes talking about money again! I thought they didn't use money in the 23rd century! I can't believe that Orgainia is THAT important. After all, the Klingons only have 8 ships in orbit. It's not like they have their entire fleet there. They both sound pretty mad. Kind of makes you feel insignificant.